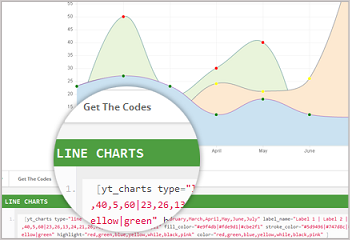 YT Shortcode - An amazing tool with fresh and clean UI layout that will help you easily add maps, forms, charts, buttons, gallery and many more items to any pages without touching any code. With 65+ essential shortcodes built-in, you are free to create nice and complex content to make your website be unique and easy-to-manage. 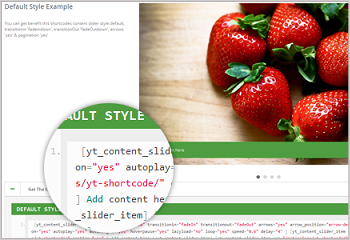 Besides, YT Shortcode supports lots of popular components as: K2, Content, Easyblog, VirtureMart, Hikashop, Joomshopping... even Custom HTML module. You can quickly choose any shortcode for your content just by clicking the YT Shortcode button. With this plugin, adding secondary shortcode (shortcode in shortcode) is not the matter now. You can combine 2 or more shortcodes to get the best result. 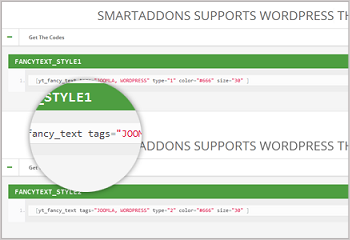 In addition, YT shortcode supports many styles for it's elements as well as provides more properties: width, height, align.. that allow user to flexibly customize any shortcode. This plugin can be used independently from YT Framework. It means that you can use it in whatever Joomla template you like. 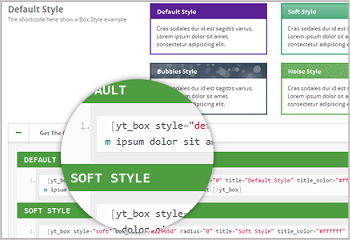 It has never been easier to add nice looking styling elements to your website with no coding knowledge requirement. Let's check YT Shortcode tour right now to feel more. 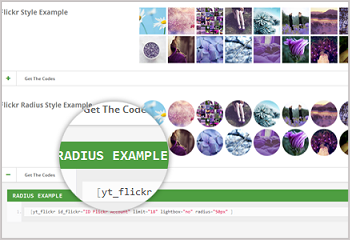 Simply create various, stunning style posts in just a few minutes with 66 feature-rich shortcodes. 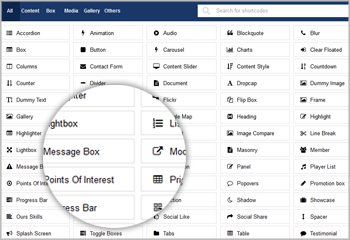 Fresh & clean UI layout will help you easily adding, managing shortcode without touching any code. It is fully responsive on any devices, screen resolutions such as smartphones, tablets, and desktops. No need to “learn” anything new to create eye-catching content. Just choose shortcodes & do some tweaks. 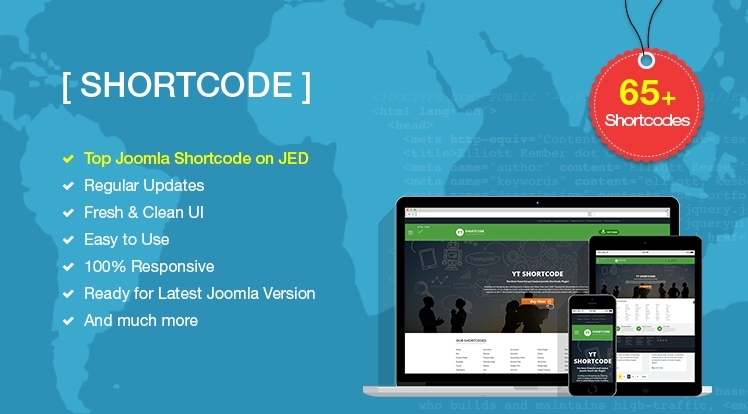 YT Shortcodes is updated regularly to bring you new features, improvements and bug fixes. It comes with a clear user guide that includes details instruction for every shortcode. It supports for K2, Content, Easyblog, VirtureMart, Hikashop, Joomshopping... even Custom HTML module. With this plugin, you can easily add secondary shortcode (shortcode in shortcode) with no matter. The plugin is fully compatible with IE9+, Firefox 2+, Flock 0.7+, Netscape, Safari, Opera 9.5, Chrome. 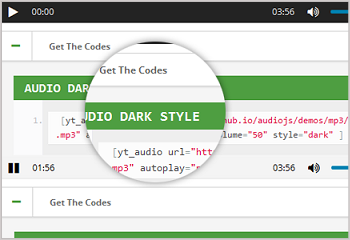 This shortcode helps to show Audio Player. You can give specific audio file url. It supports for mp3 and ogg formats. In some cases, you can need to blur your content. 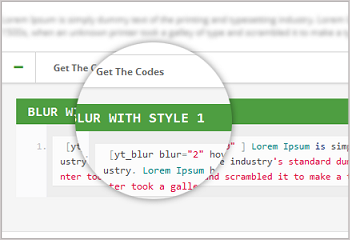 Our blur shortcode will help you. It supports to blur when hover or not. Impressing you content box with nice styling box shortcode. It also supports for radius box styles. 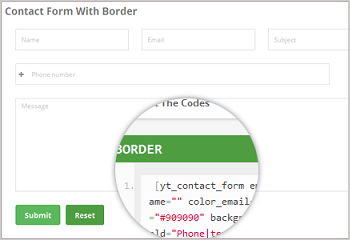 Easily creating contact form with 6 modern forms from Contact Form shortcode. You can get benefit this shortcodes content slider style default or content slider style 'dark' and many others. 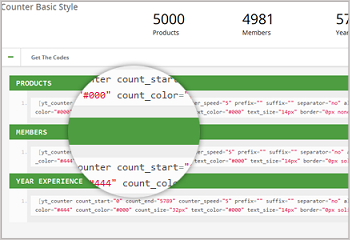 Shortly summary your number of: products, members, experience years... with the amazing Conuter shortcode. Highlight your content with our Fancy Text. With 10 fancy styles, your creation is unlimitted. Beautifully show your image as Flickr style. There are many options from its style library. To see the template list that is using YT Shortcode plugin, please go here. + Fixed bug: table incorrect displaying when content contains character ","
+ Updated more functions: Google map: width, height for shortcode; Column: change name for class # boostrap; Carousel : Add more configuration column for different device screens. + Support Joomla 3.5 and K2, Content, VM, Hikashop components.